You know how we mentioned earlier in the day that the DROID 4 may not be launching until February? Here is a bit of proof to add to that rumor. 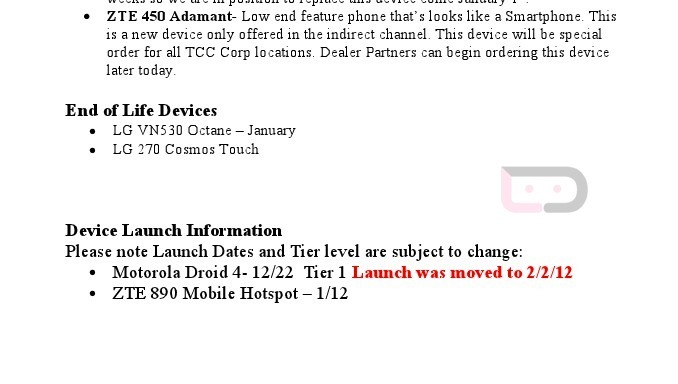 Some Verizon retailers have adjusted their target schedules from a launch date of tomorrow (12/22) to February 2. Does that seem like the oddest and longest push back ever? Yeah, pretty much. But at the same time, if Moto and VZW were going to release this phone, the market would have been completely over-saturated. I know that many of you have dreamt of a 4G LTE slider for years now, but this is most definitely not looking like the right time. The Galaxy Nexus is about to get a huge marketing push, plus the RAZR and Rezound are still new enough to grab some attention. That combination could have spelled disaster for the D4.